Older horses have a less efficient digestive system and also often less good teeth. Strucomix Senior completely fulfils these special requirements. It mainly consists of extruded grains, which can be digested much more easily and lightly; biologically very high quality proteins, which are easily digestible and are converted quickly. 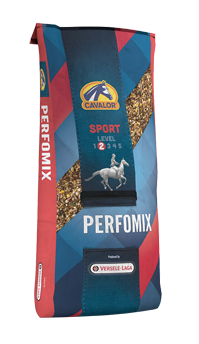 Perfomix is a balanced competition mix for active horses that is given in addition to the daily ration of hay and straw. Perfomix contains all the elements that active recreational and competition horses need for light to average work. 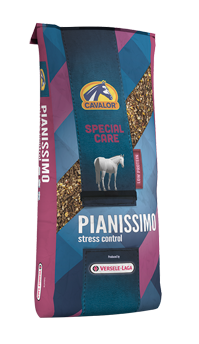 Pianissimo is specially formulated for horses and ponies prone to stress or horses that are hard to handle. Pianissimo contains herbs and other elements that counteract excessive sensitivity. 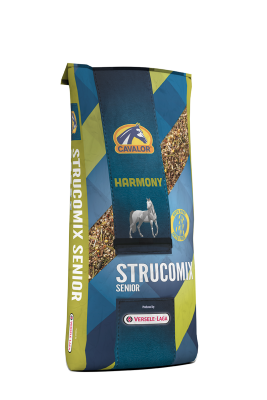 In addition it contains all the nutritional components for a complete and balanced feed for sports horses. It is highly suitable for horses at rest. It is highly suitable for horses at rest. To reduce the level of energy ingested; these horses are usually given less feed concentrate and more roughage. However this results in a nutritional imbalance which can lead to other problems for the horse in the long term. Horses were originally prairie animals that used to search all day for grasses and herbs to eat. This can still be seen in their digestive system: a small stomach and a highly developed large intestine. Today horses have to manage on highly concentrated energy feeds, relatively little hay and almost no herbs... in fact contrary to nature. 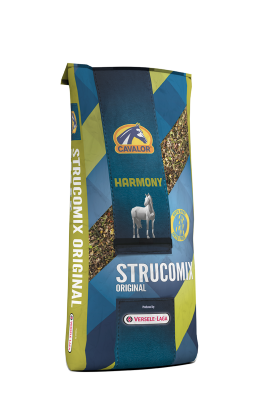 Strucomix Original is a complete maintenance feed feed that contains all the natural raw materials a horse would have freely sought itself in the past. Endurix is a feed for competition horses that have to provide long distance performance, e.g. military, carriage-driving, endurance, etc. Because these horses must deliver continuous effort, they do not only get their energy from grains, but also need long-term source of energy like vegetable fats, essential fatty acids as from rough fiber.